Vertical anchor is a structural member designed to resist the pullout forces and ensure stability of the geotechnical structures. At present, an accurate, reliable, efficient, and economic design of a vertical anchor is a challenge to many engineers. 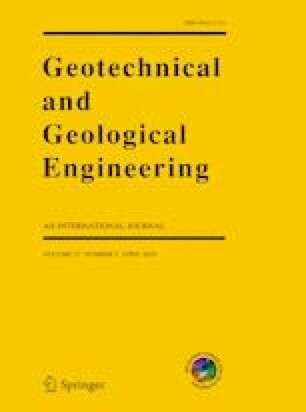 This paper presents a summary of the existing theoretical models to predict the pullout capacity of a vertical anchor embedded in cohesionless soil. An extensive literature review is conducted to compile the experimental studies available in the literature to date. Since most models hitherto focused on shallow anchors (embedment depth to anchor height ratio < 5), to ascertain the applicability of the existing models to deep anchors (embedment depth to anchor height ratio > 5), a numerical simulation is performed using PLAXIS 3D, validating against the experimental observations presented in the literature. Based on two statistical parameters, Accuracy and Reliability, a comparative assessment of the available pullout capacity prediction models is presented. Thereafter, based on the 86 experimental data available in the literature, a multiplying factor is proposed to ease the selection of any model according to the desired Accuracy and Reliability in any specific practical situation. In addition, the effect of anchor placement is also discussed while using different models. Finally, depending on the objective of the engineer, the best approach among the different models is suggested. The research was supported by the Academic Research Grant [Fund 22:5998 (5) under Grant 18] of the Bangladesh University of Engineering and Technology (BUET).